Definition: An Entrepreneur is a person who has a role of an industrialist and forms an organization for the commercial use. He is a change agent who transforms the demand into supply by forecasting the needs of the society. Innovative Entrepreneur: These are the ones who invent the new ideas, new products, new production methods or processes, discover potential markets and reorganize the company’s structure. These are the industry leaders and contributes significantly towards the economic development of the country.The innovative entrepreneurs have an unusual foresight to recognize the demand for goods and services. They are always ready to take a risk because they enjoy the excitement of a challenge, and every challenge has some risk associated with it. Ratan Tata is said to be an innovative entrepreneur, who launched the Tata Nano car at a considerably low cost. Imitating Entrepreneurs: The imitating entrepreneurs are those who immediately copy the new inventions made by the innovative entrepreneurs. These do not make any innovations by themselves; they just imitate the technology, processes, methods pioneered by others.These entrepreneurs are found in the places where there is a lack of resources or industrial base due to which no new innovations could be made. Thus, they are suitable for the underdeveloped regions where they can imitate the combinations of inventions already well established in the developed regions, in order to bring a boom in their industry. Fabian Entrepreneurs: These types of entrepreneurs are skeptical about the changes to be made in the organization. They do not initiate any inventions but follow only after they are satisfied with its success rate.They wait for some time before the innovation becomes well tested by others and do not result in a huge loss due to its failure. 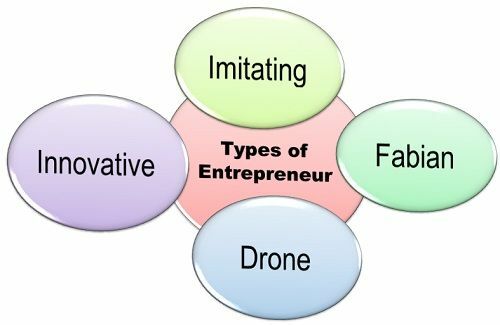 Drone Entrepreneurs: These entrepreneurs are reluctant to change since they are very conservative and do not want to make any changes in the organization. They are happy with their present mode of business and do not want to change even if they are suffering the losses. Thus, this classification is done on the basis of the willingness of an entrepreneur to create and accept the innovative ideas. Thanks for sharing! Great post, From your explanation, I think I fall into the category of the Innovative entrepreneur. Ya it’s very satisfied answer. I really thank you.